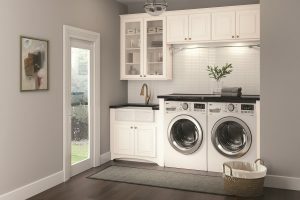 When choosing the next home improvement project, many homeowners don’t think about the area where they wash their clothes. Updating the space with laundry room cabinets, however, is an easy way to organize what is usually one of the smallest, albeit busiest, rooms of the house. Here are some ways that cabinets can improve your laundry area. Washing clothes involves keeping a lot of bottles around. Your laundry room is likely full of detergent, softener, stain remover and other products you use to make your clothes clean and fresh. Even if you have shelves, that still leaves them out in the open, making the small space look unnecessarily cluttered. They also catch the attention of small children who may not know how dangerous they can be. When you have cabinets professionally installed, you can hide your shelves behind a door so that the products are kept out of the sight of passersby and out of the reach of young fingers. The more people in your family, the more laundry accumulates, and it can become a big job quickly. Technicians can install laundry room cabinets that help you organize clothes once they are clean. Each family member can have a shelf where clothes that are ready to be put away can be stored. This keeps them from getting lost in the abyss of the laundry basket and ensures that they don’t get wrinkled before they make it to the closet. A small utilitarian room can still look beautiful. Cabinet designers can help you choose materials and hardware that match your personal style. They can help you decide where to place the cabinets and make sure you have enough to meet all the needs of the laundry area. Your laundry room can be just as attractive as the rest of your home. You don’t have to settle for closing the door to ignore the mess. Laundry room cabinets can help you organize the area to improve both the aesthetic and function of the space.